Sequans Communications SA ADR (NYSE:SQNS) stock surged today on volume almost 3 times above its average daily volume. Shares gained over 11% and the stock price hit a new 52-week high of $2.80 before closing at $2.77 at the end of the trading day. SQNS is hitting up against heavy resistance levels and will need to climb above $3.10 before the stock could potentially double or triple. 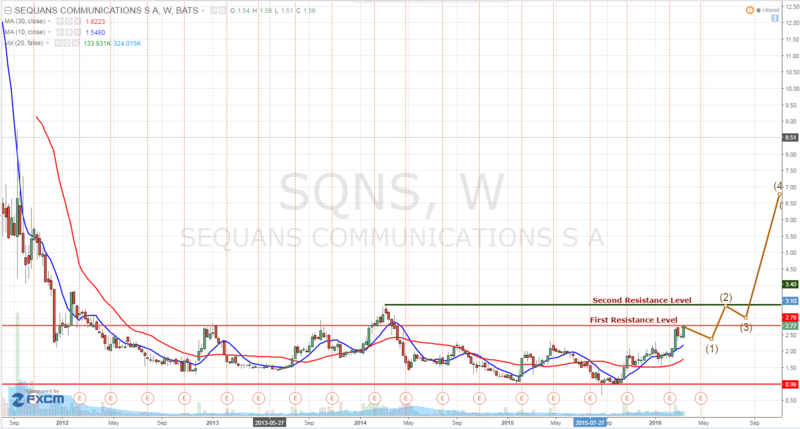 Sequans Communications SA ADR (NYSE:SQNS) began its rally towards the end of February where the stock has climbed over 50%. SQNS has made a string of announcements and several developments over the last month which has sparked this advanced. It began with the announcement of the company introducing the industry’s first LTE Cat M Chip that is specifically designed and made for the booming industry of IoT (Internet of Things). For those of you who don’t know technology, this is huge and will likely propel SQNS forward and upward. In addition to this new product, Sequans Communications SA ADR (NYSE:SQNS) has announced several new partnerships with the first being Gemalto. SQNS and Gemalto are extending their earlier partnership on Cat 1 LTE technology and will also be for Cat 2. It has also extended a partnership with Telstra to advance its Cat 1 technology in Australia. There will likely be a string of new partnerships as the SQNS attempts to have massive adoption of its Cat LTE technology. In fact, SQNS and Skyworks (yes the $14 billion company that develops solutions that go in Apple products) has delivered the words first solution optimized for LTE Category M Applications. This combines RF module capabilities with SQNS Monarch Chip to capitalize on the growing demand for embedded cellular connectivity. SQNS has also began increasing its IP portfolio by licensing core patents for IoT from Acorn Technologies. SQNS is firing on all cylinders as shown by its financial performance and surge in revenues. Revenue soared 18% in Q4’15 to $11 million compared to third quarter 2015. Revenue increased a whopping 68% compared to the same period year prior (Q4’14). Net operating loss was reduced significantly from ($9.2) million loss in 2014 Q4 down to only ($5.1 million) operating loss in 2015 Q4. For the full year 2015, revenues soared 45%. SQNS expects continued revenue growth from that launch of its new product in the Machine-to-Machine and IoT industries. SQNS is currently trading at a $95 million market valuation. This is a very exciting company that just hit a homerun with its new product that is targeted towards the fast growing industry of IoT and M2M. As the chip gains more traction, revenues will continue to grow and its bottom line should grow as well. It wouldn’t be surprising to see its operating loss turn into operating income in the next few quarters. Expect big things from this microcap company. Stay tuned as we will be updating it as developments unfold. We will be updating on SQNS when more details emerge so make sure you are subscribed to Microcapspot so you know what’s going on with SQNS. Disclosure: we hold no position in SQNS either long or short at the publication of this article and we have not been compensated for this article.